Dr A E Voskuyl, Department of Rheumatology, Room B-417, University Hospital Vrije Universiteit, PO Box 7057, 1007 MB Amsterdam, the Netherlands. OBJECTIVE To determine the diagnostic value of perivascular infiltrates (PVI) in randomly obtained muscle biopsy specimens for the assessment of rheumatoid vasculitis (RV). METHODS The number and size of PVIs, defined as the presence of mononuclear or polymorphonuclear cells around ⩾ 50% of the circumference of a vessel wall, as well as the presence of fibrinoid necrosis were determined in frozen sections of muscle samples of RV patients with histologically confirmed vasculitis in fixed muscle tissue (n=12). The findings were compared with those observed in frozen sections of muscle biopsy specimens of rheumatoid arthritis (RA) patients not suspected of vasculitis (n=14) and patients with osteoarthritis (OA) (n=11). The presence of PVIs and of fibrinoid necrosis were sought in four frozen sections of the muscle biopsy specimen. RESULTS PVIs were observed in 75% of the RV patients, which was significantly (p < 0.05) higher than the frequency found in RA (14%) or OA (18%) patients. PVIs with ⩾ three cell layers were found in 67% of the RV patients and in none of the RA and OA patients (p < 0.05). Fibrinoid necrosis was found in least one of four frozen section in 33% of the RV patients. There was a good intra-observer and inter-observer concordance on the presence of fibrinoid necrosis and of PVIs with ⩾ three cell layers. CONCLUSIONS The assessment of PVIs with ⩾ three cell layers in a muscle biopsy specimen is a specific and reliable test in discriminating RV from RA without vasculitis. The demonstration in muscle of PVIs with ⩾ three cell layers is more sensitive than that of fibrinoid necrosis in the diagnosis of RV. In RV patients, perivascular infiltrates (PVI) with mono/polymorphonuclear cells are regularly observed in both normal and abnormal vessels.6 The perivascular inflammatory cells are arranged in layers that vary in number and size. Previous observations in skin biopsy specimens report that the number and size of PVI are greater in the non-lesional skin of RV patients when compared with rheumatoid arthritis (RA) patients without vasculitis.13Our experience with muscle biopsy specimens suggested that PVIs occur more frequently than fibrinoid necrosis in RA patients suspected of vasculitis. This study was designed to evaluate whether the presence and the size of PVIs in muscle biopsy specimens might contribute to the diagnosis of RV. This was done by comparing standard assessment of muscle biopsy specimens of two contrasting patient groups: (1) RA patients with clinical and histological evidence of vasculitis, (2) RA patients and patients with osteoarthritis (OA) without clinical and histological evidence of vasculitis. Twelve RA patients with clinical symptoms and histological evidence of vasculitis were studied as RV patients. These patients were selected when fibrinoid necrosis was observed during extensive histological examination of the rectus femoris muscle biopsy specimen. The RV patients, five female and seven male, had a median age of 70 years (range 54–81) and a median RA disease duration of 20 years (range 1–52). All RV patients had increased serum concentrations of rheumatoid factors during their RA history, and 67% had rheumatoid nodules. At the time RV was diagnosed five of the patients were being treated with disease modifying anti-rheumatic drugs (DMARDs), and two with corticosteroids. Table 1 shows the clinical signs that led to the suspicion of vasculitis in the RV group. In addition, 14 RA patients and 11 OA patients were studied as controls. A sample of the rectus femoris muscle of these patients was obtained during surgery for a total hip or knee arthroplasty. The RA control patients, 10 female and four male, had a median age of 70 years (range 56–86) and a median RA disease duration of 12 years (range 1–32). Thirteen of 14 RA patients had increased serum concentrations of rheumatoid factors during their RA history, and 43% had rheumatoid nodules. At the time of the muscle biopsy, nine of the RA patients were treated with DMARDs, but none with corticosteroids. The OA patients, eight female and three male, had a median age of 70 years (range 52–87). None was treated with DMARDs or corticosteroids. None of the patients with RA or OA had histological evidence of vasculitis on extensive histological examination of the muscle biopsy specimen. All RV and RA patients fulfilled the 1987 American Rheumatism Association criteria for RA. Informed consent was given by all patients. The study protocol was approved by the Committee of Medical Ethics of the University Hospital Leiden. The muscle sample of all patients was obtained according to a predefined protocol by an open surgical procedure from a (non-symptomatic) rectus femoris muscle. The muscle sample was divided into two parts. One part was used for extensive histological examination; in the absence of fibrinoid necrosis in the first series of sections, a total of 45 sections were subsequently analysed for the presence of fibrinoid necrosis. The sections were cut and stained with haematoxylin and eosin. The other part of the muscle tissue was snap frozen in Tissue-Tek OCT (Miles Inc-Diagnostic Division, Elkhart, IN) by immersion in methylbutane (−70°C). Frozen blocks were stored at −70°C until sectioned for staining. Serial sections of 7 μm were cut on a cryostat and placed on glass slides (Star Frost adhesive slides, Knittelgläser, Germany). From these frozen sections, four sections were chosen randomly at a regular interval of 80 μm and stained with haematoxylin and eosin. Haematoxylin and eosin stained sections of the frozen blocks were coded and analysed randomly. The area of each section was measured and the histological features were scored by two independent observers, who were unaware of the diagnosis. One observer (AEV) scored the sections twice with an interval of two weeks. The presence of fibrinoid necrosis, the number and the size of PVIs were assessed in each frozen muscle section. Fibrinoid necrosis was defined as the observation of amorphous eosinophilic material within a vessel wall. A PVI was defined as the presence of mono/polymorphonuclear cells around, at least 50%, of the circumference of a vessel wall. A vessel should be clearly visible, as defined by the presence of a lumen surrounded by a vessel wall. The size of a PVI was defined by the number of cell layers that surrounded, at least 50%, of the circumference of a vessel wall. Subsequently, each muscle section was classified into a PVI category, according to the highest number of cell layers observed. Three categories of PVIs were discerned: 1= at most one cell layer; 2= at most two cell layers; 3= 3 or more cell layers. Comparison of the muscle samples between the RV, RA, and OA patient were done for: (1) the presence of PVIs and for the PVI category using the χ2 test; (2) the total number of PVIs and the median surface area of the four sections using the Kruskal-Wallis test and the Mann-Whitney U test. The sensitivity and specificity in discriminating RV from non-RV was calculated for the presence of PVIs and for the various PVI categories. The intra and inter-observer agreements on the presence of fibrinoid necrosis and PVIs were estimated by Cohen’s κ, and by Spearman’s rank correlation for the category of PVI. p Values less than 0.05 were considered significant. The median surface area of the four frozen muscle sections of RV patients (43 mm2; range 19–110 mm2) was not significantly different from that of RA patients (42 mm2; range 24–77 mm2) or of OA patients 43 mm2; range 21–121 mm2). In the fixed muscle sections fibrinoid necrosis was observed in all RV patients and in none of the RA or OA patients. When considering just the four frozen sections, fibrinoid necrosis was observed in four of 12 RV patients and in none of the RA or OA patients (table 2). The results presented are those as scored at the first examination of one observer (AEV). Fibrinoid necrosis was always accompanied by a PVI around the same vessel (fig 1(D)). The intra and inter-observer Cohen’s κ agreements on the presence of fibrinoid necrosis in the four muscle frozen sections were 1.0 (SEM 0.16) and 0.87 (SEM 0.12), respectively. The only inter-observer disagreement concerned the presence of fibrinoid necrosis in one muscle section of a RV patient. PVIs were observed significantly more frequently in the muscle sections of the RV patients when compared with those of the RA or OA patients (table 2). The number of PVIs was also found to be higher in the muscle sections of RV patients when compared with those of both RA and OA patients (table 2). PVIs were found around vessels with and without fibrinoid necrosis. In the muscle sections without fibrinoid necrosis, PVIs were also found more frequently in RV patients when compared with RA and OA patients. PVIs consisted mainly of mononuclear cells (fig 1). Polymorphonuclear cells were observed in small numbers and only in the muscle sections of RV patients with fibrinoid necrosis (data not shown). The intra and inter-observer Cohen’s κ agreements on the presence of PVIs were 0.82 (SEM 0.09) and 0.63 (SEM 0.14), respectively. The sensitivity and specificity of the presence of PVIs in discriminating RV from non-RV were 75% and 86%, respectively. (A) PVI with one cell layer (arrow): at most one cell layer of mononuclear cells surrounding at least 50% of the vessel wall. (B) PVI with two cell layers (arrow): at most two cell layers of mononuclear cells surrounding at least 50% of the vessel wall. (C) PVI with ≥ three cell layers (arrow): three cell layers of mononuclear cells surrounding at least 50% of the vessel wall. (D) Fibrinoid necrosis (large arrow), PVI with ≥ three cell layers (small arrow). Haematoxylin and eosin stain; original magnification × 400, bar = 40 μm. PVIs with one or two cell layers were observed in the muscle sections of all patient groups (table 2). PVIs with ⩾ three cell layers were only observed in the muscle sections of RV patients (table2). In the 32 frozen muscle sections of the eight RV patients in whom PVIs with ⩾ three cell layers were observed, 11 sections showed no PVIs with ⩾ three cell layers nor fibrinoid necrosis, 11 sections showed PVIs with ⩾ three cell layers as well as fibrinoid necrosis, and 10 sections showed PVIs with ⩾ three cell layers but no fibrinoid necrosis. In the 16 frozen muscle sections of the four RV patients in whom PVIs with ⩾ three cell layers was absent, two sections showed PVIs of one or two cell layers and 14 sections showed no PVIs. In addition, none of those 16 sections showed fibrinoid necrosis. The intra and inter-observer agreements on the presence of PVIs ⩾ three cell layers as assessed by the Spearman rank correlation were 0.92 (SEM 0.93) and 0.84 (SEM 0.10), respectively. The intra and inter-observer disagreement on the number of cell layers consisted of a maximum variation of one cell layer. The intra and inter-observer disagreement on the presence of PVIs ⩾ three cell layers concerned one and two RV patients, respectively. Disagreement did not occur in the RA or OA groups. Figure 1 shows examples of PVI categories. The sensitivity and specificity of PVIs ⩾ three cell layers in discriminating RV from non-RV was 67% and 100%, respectively. The results of this study show that the presence of a PVI with ⩾ three cell layers in a muscle biopsy specimen is a highly specific and reliable test, and when compared with the presence of fibrinoid necrosis, a more sensitive marker for the diagnosis RV. Fibrinoid necrosis was chosen as the histological hallmark of RV. Transmural infiltration of the vessel wall is another morphological abnormality associated with vasculitis. As previously noted,6 transmural infiltrates are difficult to determine in muscle biopsy specimens because of the small calibre of the vessels. Hence, transmural infiltrates were not investigated separately in this study. It should be noted that the presence of PVIs with ⩾ three cell layers was assessed in patients with vasculitis histologically confirmed (fibrinoid necrosis) in the same muscle biopsy specimen. At present, the sensitivity of PVIs with ⩾ three cell layers for RV is unknown in patients without histological evidence of fibrinoid necrosis in a muscle biopsy specimen. Following this study, however, we reviewed the histological features in the muscle biopsy specimens of eight RV patients without vasculitis histologically confirmed in a muscle biopsy specimen. In those patients vasculitis was observed in a biopsy specimen of the skin or sural nerve. Re-examination of the muscle biopsy specimens showed that six of eight specimens had PVIs with ⩾ three cell layers, which is consistent with the results of this study. The PVIs in the muscle biopsy specimens of this study consisted predominantly of mononuclear cells. Some authors have referred to this type of morphological change as lymphocytic vasculitis,20although others have wondered whether lymfocytic vasculitis is a clinicopathological entity as it may occur in a large number of dermatological diseases.21 Anyhow, the results of this study suggest that PVIs in muscle biopsy specimens are a marker of vasculitis in patients with RA. The diagnostic yield of a muscle biopsy specimen for the assessment of vasculitis in RA has been hitherto considered to be low, and this has been ascribed to the segmental distribution of vasculitis within the muscle.4 In line with the findings of others,6 we found that the examination of multiple muscle sections improves the diagnostic yield. For routine examination the number of sections examined is generally lower, and close to the four sections assessed in this study. Despite the limited number of sections assessed, our results show that PVIs with ⩾ three cell layers are found more frequently than fibrinoid necrosis, and suggest that the assessment of PVIs increases the diagnostic value of a muscle biopsy specimen. Should the presence of a PVI with ⩾ three cell layers become accepted as a diagnostic criterion for RV, then the results of this study imply that a careful review of a limited number of spaced muscle sections would be sufficient to establish the diagnosis. In addition, the absence of large PVIs in a muscle biopsy specimen of RA patients strongly suggests the absence of RV. Furthermore, the assessment of PVIs may also be valuable in patients suspected of other vasculitis syndromes such as periarteritis nodosa. The study was supported by a grant from ‘het Nationaal Reumafonds’. (1981) Systemic rheumatoid vasculitis: a clinical and laboratory study of 50 cases. Medicine (Baltimore) 60:288–297, . (1986) Rheumatoid vasculitis: survival and associated risk factors. Medicine (Baltimore) 65:365–375, . (1996) Factors associated with the development of vasculitis in rheumatoid arthritis; results of a case-control study. Ann Rheum Dis 55:190–192, . (1951) Arteritis of striated muscle in rheumatoid arthritis. Am J Pathol 27:157–173, . (1990) Diagnostic histopathology of major systemic and pulmonary vasculitic syndromes. Rheum Dis Clin N Am 16:269–292, . (1957) Vascular lesions in rheumatoid arthritis. J Chron Dis 5:668–687, . (1994) Nomenclature of systemic vasculitides: proposal of an international consensus conference. Arthritis Rheum 37:187–192, . (1985) IgA containing immune complexes in rheumatoid vasculitis and in active rheumatoid disease. J Rheumatol 12:449–455, . (1981) Rectal biopsy in the diagnosis of systemic vasculitis. J Clin Pathol 34:843–850, . (1996) The mortality of rheumatoid vasculitis compared with rheumatoid arthritis. Arthritis Rheum 39:266–271, . (1952) Muscle biopsy in the diagnosis of periarteritis nodosa. Surgical Clinics of North America 32:1225–1233, . (1989) Diagnostic studies for systemic necrotizing vasculitis. Arch Intern Med 149:161–165, . (1984) Rheumatoid arthritis. The clinical significance of histo-and immunopathological abnormalities in normal skin. J Rheumatol 11:448–453, . 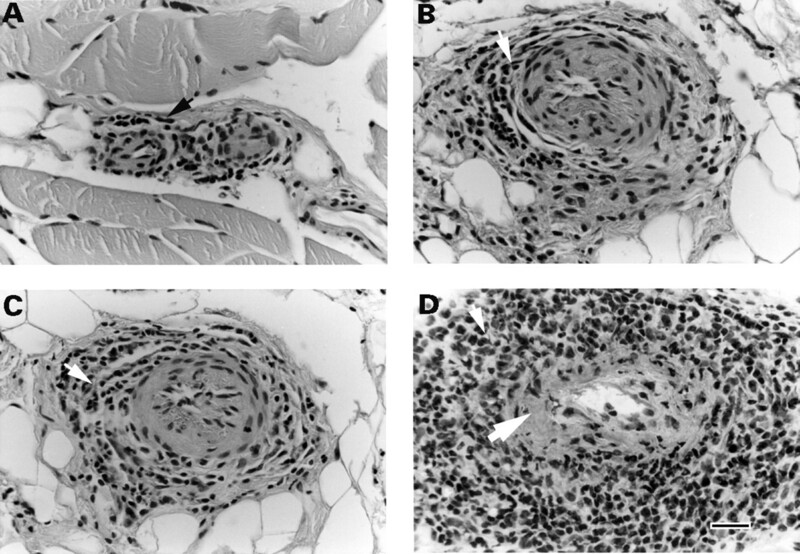 (1950) Diagnostic value of histologic lesions of striated muscle in rheumatoid arthritis. Am J Med Sci 219:174–182, . (1958) Diagnostic significance of the muscle biopsy. Am J Med 25:600–610, . (1962) The diagnostic value of muscle biopsy in rheumatoid arthritis. Acta Rheum Scand 8:103–118, . (1963) Muscular changes in rheumatoid arthritis. Ann Rheum Dis 22:342–347, . (1977) Muscle changes in rheumatoid arthritis. Virchows Arch 373:267–278, . (1972) Muscle pathology in rheumatoid arthritis, polymyalgia rheumatica, and polymyositis. Arch Pathol 94:101–118, . (1996) Cutaneous lymphocytic vasculitis: a definition, a review, a proposed classification. Semin Diagn Pathol 13:72–90, . (1984) Lymphocytic vasculitis: is it a specific entity? J Cutan Pathol 11:132–139, .